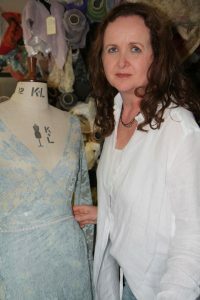 NEWBRIDGE fashion designer Mary Grant unveiled her latest collection at her store on Cutlery Road last week marking 25 years in the fashion business. The collection reflects Mary’s signature relaxed style with its mix of tunics, knits, dungarees and pinnies. She never fails to stay on trend and her clothes are designed as always to ensure maximum comfort while flattering every body shape. Mary has always based her collections on the kind of clothes she would wear herself and attracted a loyal fan base who appreciate her signature look – hippie romantic chic. “For 25 years I have designed collections based on customer feedback. Our customers have shared their challenges, their perceived bodily imperfections, how they have hectic lives and need to look good while being comfortable enough to get things done,” said Mary. She is known for creating pieces with a mix of glamour and grunge and for using asymmetrical cuts and beautiful fabrics. Layering plays a big part of the collection with colours from new and previous seasons allowing customers to build on their past pieces and create a unique capsule wardrobe. Each piece can be mixed and matched to create new outfits for every occasion. Mary’s basic jerseys are a huge hit with her followers as they are famous for holding their shape and looking new “wash after wash, year after year”. She set up her studio 25 years ago in Kildare after studying in the Barbara Burke College of Fashion. Earlier this year she was chosen as the Network Ireland SME Business Woman of the Year in Kildare and she is currently in the process of writing a book which will be launched next year. Mary Grant’s AW18 collection is available at www.marygrant.com, the site is updated daily and new styles are added each season.